The Journey and occasional ramblings of a Strength & Conditioning coach, PhD student and science enthusiast with a passion for Combat Sports. Feel free to read and share. Physiological Responses to Linear/Non-Linear Soccer Simulations. Charcot-Marie-Tooth Disease (CMT): Brief Etiology, Clinical Presentation and Rehabilitative considerations. From the film ‘Concussion’ in 2015 based on some real life events and people. Now while the whole film, let alone the quote, may not be completely scientifically accurate (or even about concussions). It is a profound statement allowing us to recognize the amazing intricacy of design for each and every organism, yet how fragile and dependent we are upon these designs. The brain sits in a pool of cerebrospinal fluid without any connection to the skull. As shown in the quick movie clip; the example of an apple in a slightly filled jar of water gives us a parable of how the brain moves with each impact to the skull (in this case, the jar). With each impact to the jar, it leads to the loss of integrity of the apple, eventually causing it to crack. In the case of the brain? It’s a lot more complex than that.. a neatly packed piece of jelly with specific functions, hitting onto the cranium and causing the jelly to be stretched and sheared at a microscopic level. SO what is a ‘Concussion’? Concussion, also known as Mild Traumatic Brain Injury (mTBI), is an injury through impact to the head (brain) which causes temporary losses in brain function. It makes up 80-90% of TBI cases but is notably distinguishable from other forms of TBI because, there are no gross pathologies such as a hemorrhage or identifiable damage of the neural structure through conventional neuroimaging techniques such as MRI (Noble & Hesdorffer, 2013). This means it is quite difficult to diagnose and has many generic symptoms which can easily make it a condition which is misdiagnosed or more importantly, ignored or unnoticed. How does it happen/What causes it? 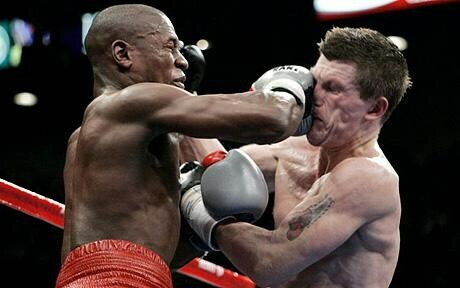 The principal causes of head trauma in combat sports include straight impact blows to the face (e.g. jabs and front kicks) leading to linear acceleration of the head or impact from an angle (e.g. roundhouse kicks, hooks and uppercuts) leading to rotational acceleration (Unterharn-scheidt, 1995). High incidences are also seen within sports such as American Football, Hockey, Rugby, Football (soccer) and Basketball (Harmon et al., 2013). These are the results of head on head collisions and collisions with the ball or ground. The movement of the brain within the skull can lead to shearing of cells along with stretching and disruptions at the structure of the neurons within the brain. The stronger the impact, the larger the stretch and deeper it may affect the brain. It is said that a 15% stretch of the neuron length will result in biochemical changes (such as membrane depolarization and deregulated release of neurotransmitters) resulting in an acute failure of neurons leading to a concussion (Gaetz, 2004). Some studies have suggested changes in neural function even after standard header practices within soccer, which may suggest that with each exposure to head impact, there is an increased risk of concussion. The Centre for Disease Control and Prevention (CDC) reports an estimate of 135,000 patients per year to arrive at emergency departments with concussions from sports or recreational activity (Laker, 2011). Within combat sports, particularly boxing and kickboxing, concussions account for approximately a third (33%) of injuries experienced by fighters . Similarly, 28.3% of fight stoppages within MMA have been reported due to head trauma with a rate of 15-16 concussions per 100 bouts (Curran-Sills & Abedin, 2018; Hutchison et al., 2014; Buse, 2006). It is most frequently observed in American football, especially linemen and linebackers, who are reported to be exposed to more than 1000 impacts per season (Crisco et al., 2010). (McCrory et al., 2012; Ropper & Gorson, 2007; Hall et al., 2005). Most recover within days to weeks. However, 10-15% may experience persistent issues even after a year (Hall et al., 2005; Sterr et al., 2006). Though loss of consciousness (e.g. Knockouts) is generally attributed to concussion, it is important to note that this is only known to occur in 10-20% of cases (Giza & Hovda, 2001), indicating it still may occur 80-90% of the time, regardless of an obvious sign. However, even if these symptoms are eventually not apparent.. or concussion is not diagnosed..
with newer electro-physiological techniques, researchers now question has the brain actually recovered? Yes, the symptoms can cease to exist, but are there any unknown/residual effects? Short answer: We’re not quite sure yet! Less shorter answer: The risk of further concussions and musculoskeletal injuries have been reported to increase in athletes with previous concussions (Guskiewicz et al., 2003; Herman et al., 2016; Nordstrom et al., 2014), which suggests that some of these concussion-related changes to the brain have not yet truly healed. Some research also suggests that in some cases, the brain to muscle pathway still portrays signs of disrupted neural pathways even after 9 months post concussion (Lewine et al., 2007; Huang et al., 2009; Lewis et al., 2017). Therefore the question is: How much do we still not actually know about the effects and potential causes of concussion in sports, let alone the sports which involve which involve repetitive head impact?